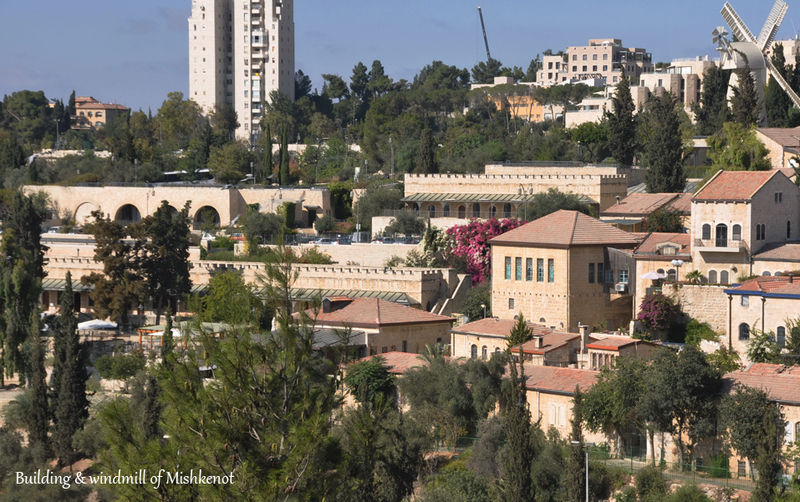 When we speak of this lovely 19th century neighborhood Yemin Moshe, we are referring, in fact, to two neighborhoods which are connected to each other, but are actually very different from each other. One is Yemin Moshe. 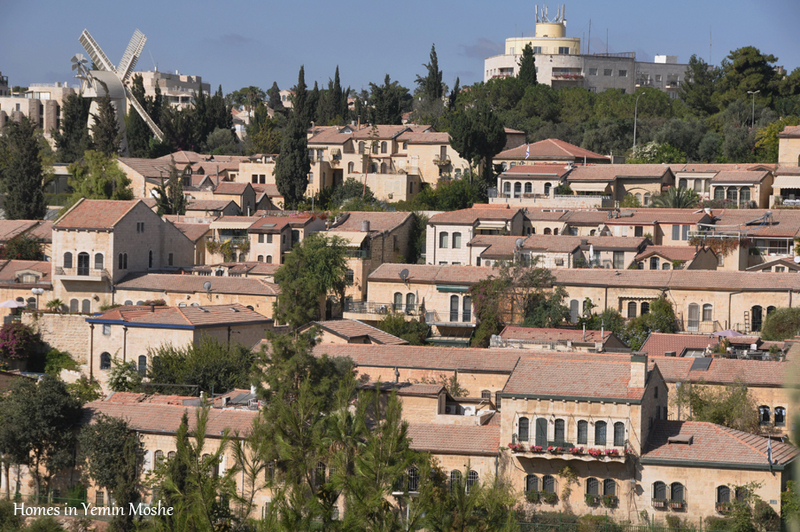 The other one is Mishkenot Sha’ananim, the first neighborhood outside of the city walls. Until 1860, nobody dared live outside of Jerusalem’s walls because of the dangerous conditions there. At that time, the population of the Jewish Quarter grew rapidly, its population climbing to 10,000 (today it has only 4,000 people). Because of the terrible poverty and hygienic conditions, there was a lot of disease, such as typhoid, dysentery, and even cholera. The English Jewish philanthropist Sir Moshe (Moses) Montefiore, decided to improve the area by buying 45 acres opposite the city walls and to the west. This piece of land was designated for spacious and healthier lodging for poor yeshiva students. A long building with 28 two-bedroom apartments, with a roof designed like the city wall, was built in 1860, alongside a shorter building and a windmill that supplied work for the neighborhood. 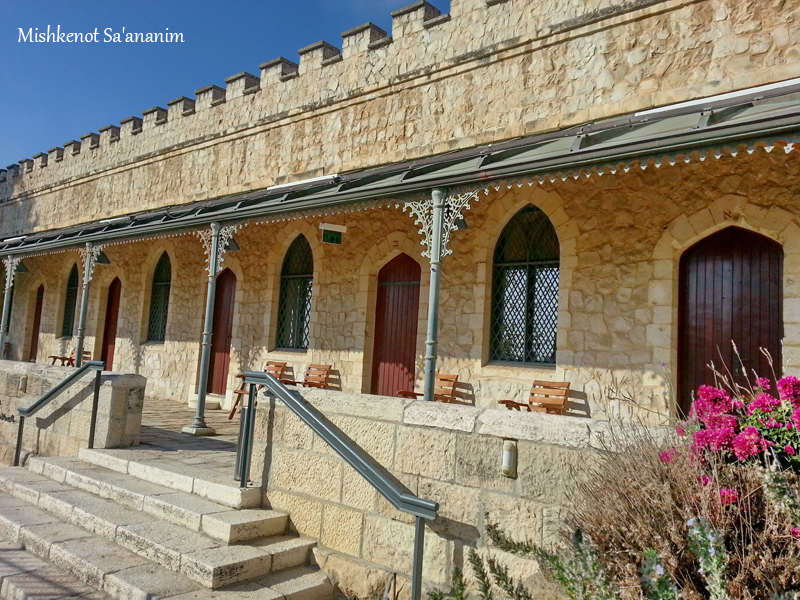 This was Mishkenot Sha’ananim (Dwelling of the Peaceful). In the beginning, Mishkenot Sha’ananim wasn’t a big success because people didn’t want to move outside of the city walls. Only the cholera plague of the mid-1860’s drove people out of the Jewish Quarter, and then the city started expanding. In the 1890’s another neighborhood was built next to Mishkenot Sha’ananim, also funded by Montefiore’s foundation, and was called Yemin Moshe (Right Hand of Moses). 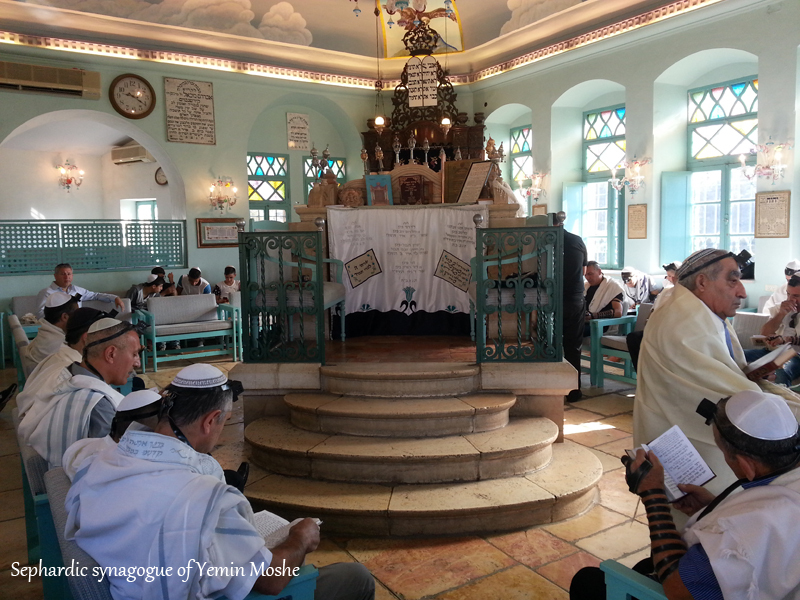 It had an Ashkenazi community, as well as a Sephardic one, each of them having its own synagogue. Between 1948 and 1967, the neighborhood stood next to the border with Jordan (that ran through the city), and only poor people lived there. After Jerusalem was united in 1967, a decision was made to transform the neighborhood into an artists’ colony. The inhabitants received new apartments at the far ends of the city, the old houses were renovated, and were sold only to people who could afford to buy them. Today, this is a charming place to take a walk, especially at sunset, when the city walls on the opposite side of the valley are so beautifully illuminated by the setting sun.